Sakibul Islam, I am a blogger & entrepreneur. The physical fitness is the high priority for people who perform regular workouts or exercises to obtain the young look and stay active through the entire day. Proper exercises are essential for everyone to maintain a healthy lifestyle and refreshment. Because of these daily routines, the internal organs of a person are working properly which results in adequate growth and repairing of the cells. If you are not aware of any workouts then don’t worry, regular cycling is an excellent activity for fitness. Riding a bicycle makes fun, as well as fit with friends and family for a short ride. 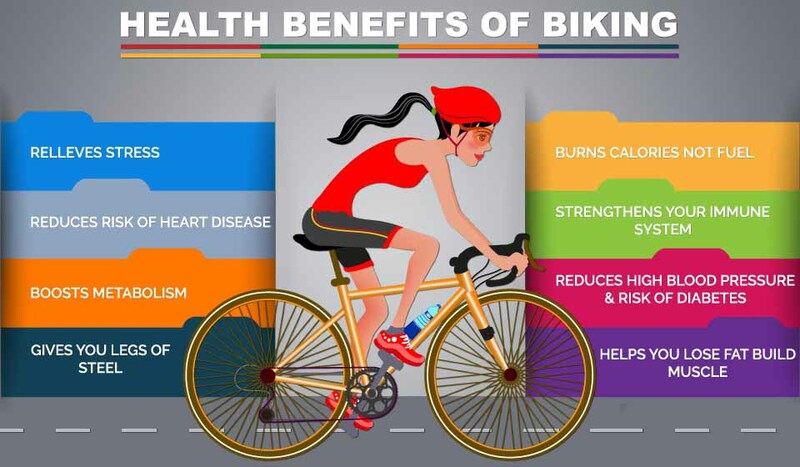 Regular bicycle riding improves your cardio well-being, and short rides also help to boost your fitness. It protects from several diseases like strokes, diabetes, obesity, arthritis, and depression. Riding is a low-risk form of exercise in which it causes a low impact on joins that suits for all age groups without any concerns. Regular bicycle for fitness needs proper nutrition. Taking right diet is a key to boost up your riding activity and move forward with confidence. You can get the real-life advice from nutritional experts. The riding position in your bicycle is also an important key to improve the physical performance. Make sure to get a more comfortable bike that allows you to ride for a long time. In cycling, there are numerous ways from the simple ride to a longer one, all of which depends on your preferences and capabilities. So that opts for the best that suits you to get fitter. Set a goal in the beginning day itself of your ride and maintain a fitness dairy to know the improved progress. This will encourage the motivation towards reaching the target at the end of the day. Daily cycling is a way of challenging our fitness and allows the body ready to get fitter. Don’t give any chances for intervals and need to increase the difficulty of new challenges. Bicycle riding strengthens bones and joint mobility. Surveys reveal that riding is good for cardiovascular health. Cycling reduces the stress levels and enhances the refreshment. Reduce the body fat levels and maintain the body to fit. It improves the coordination and posture. Riding reduces the anxiety and depression of focusing on a goal. It builds muscle as you pedal on riding. Riding makes fun, healthy and low-impact on joints that suits for all age groups. Easy to do without any cost and also links to your daily routine to go to a store or some work. Cycling boosts your strength, stamina, and aerobic fitness that you get simply with less effort. Reduced chances of occurring several diseases like heart strokes, cancer, obesity and many more. Cycling increases your brain power and navigation capabilities. Bike riding reduces tiredness and elevates you to get quality sleep. I help entrepreneurs become the go-to in their industry. And, I like share different tips of tips and tricks.